When I was a few years old, I approached my grandfather with an odd request. “Grampa, can I borrow a screwdriver? I need one of the flat ones.” After a series of carry-this-with-the-point-facing-downward and please-don’t-run warnings, he fished the requested tool from a kitchen drawer. Some time later, much to his surprise and chagrin, I proudly reappeared with two door knobs and a latch mechanism in hand. I had noticed the knobs would operate the latch when turned in one direction, but when turned in the other direction nothing would happen. By methodically disassembling the door latch I had learned that the rectangular shaft the knob turns inside of the door was made of metal and accepted by an asymmetrically worn plastic part within the latch mechanism. I found the reason that turning the knob worked in only one direction. My sharing this discovery amused my parents. My bemused grandfather asked me to please put his front door back together. I am a software developer now, so I’m essentially an overgrown version of that methodically tinkering kid. At Enharmonic we spend a lot of time writing complex iOS applications. During the course of this work it is not uncommon for us to push beyond documentation to ascertain how iOS actually behaves internally. Imagine that you’ve been asked to create a view controller for displaying a PDF using a UIWebView. This view controller should monitor the scroll position of the PDF to display auxiliary UI when the user scrolls to a particular point inside. It seems pretty straightforward to implement this behavior: subclass UIWebView, load the PDF, override the UIScrollViewDelegate methods to monitor the scroll view’s scroll position, update your auxiliary UI as needed. Done! Unfortunately, the documentation disallows subclassing UIWebView. The UIWebView class should not be subclassed. UIWebView implements the UIScrollViewDelegate protocol. A scroll view’s delegate can respond to scrolling events when the user interacts with the scroll view and can customize zooming behavior by providing a view within the scroll view for the system to scale up and down as the user pinches. 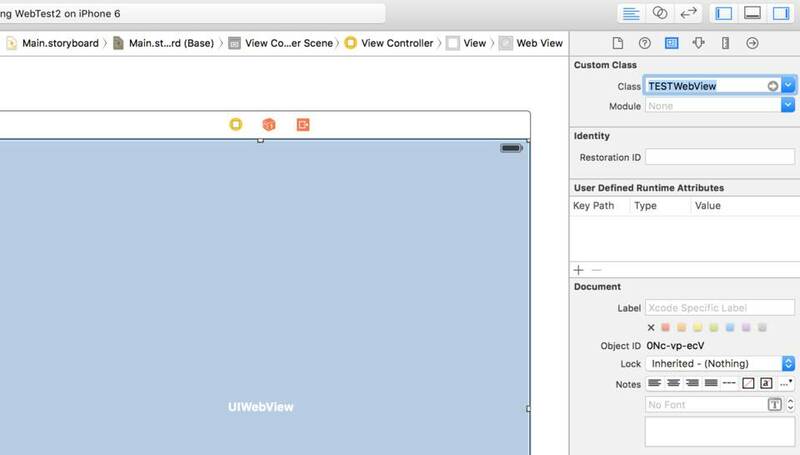 In the scenario described above you would need to find a way to insert some code into the UIScrollViewDelegate methods of the UIWebView without getting in the way of Apple’s implementation of the UIWebView to override the delegate methods. You are not allowed to accomplish this by subclassing UIWebView. Since the web view is its scroll view’s delegate, it may not respond well to some other object becoming its scroll view’s delegate. A UIScrollView can have only one delegate and the web view definitely needs to know about scrolling, but so does your view controller. They can’t both be the delegate. The documentation does not address whether being allowed to “…access the scroll view if it wants to customize the scrolling behavior of the web view” extends to becoming that scroll view’s delegate instead of its web view nor does it mention how to do so without causing problems for the web view. How can you implement the behavior you need? Would setting the scroll view’s delegate to an object other than its web view lead to problems in the web view itself? Grab a screwdriver. You are going to tear this doorknob apart to reverse engineer your way to answers that the documentation does not directly provide. We have created a sample project called WebTest2 for testing UIWebView. Download the project here. Open it in Xcode and build and run the app on a device or on the simulator. It should look like the image below. Open ViewController.m. Notice that it has an IBOutlet property connected to a UIWebView loaded from the app’s main storyboard file. 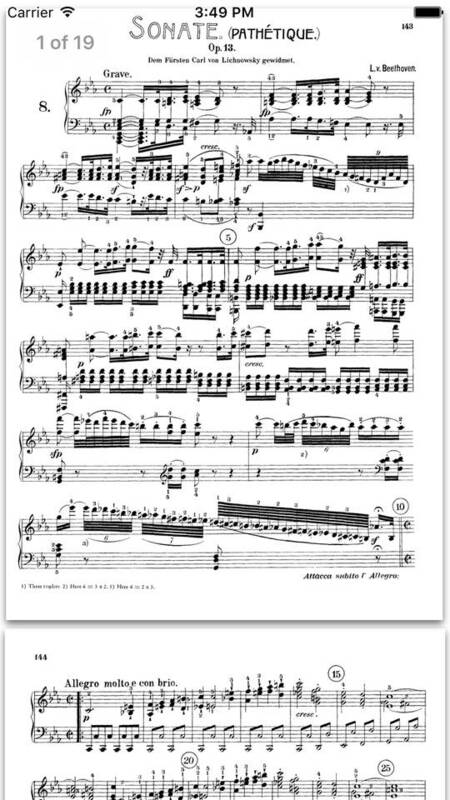 The view controller loads a PDF containing a Beethoven piano sonata during the viewDidLoad method shown below. Note: You may also notice some commented-out code in ViewController.m and that we’ve implemented a subclass of UIWebView with some commented-out UIScrollViewDelegate methods inside. You will need this code later on in this tutorial. You have probably used the LLDB debugger in Xcode to investigate bugs in your iOS or OS X code. Xcode’s UI allows you to add breakpoints, to step through your C, C++, Objective-C, or Swift code, and to investigate the values of local variables as your project as it is running on a device or on the simulator. In addition to the features exposed by Xcode’s UI, LLDB contains a powerful set of debugging features through a command line interface. Open ViewController.m and add a breakpoint at the top of the viewDidLoad method by clicking in the trough to the left of the code on line number 20 (ViewController.m:20). Build and run the app. The debugger should stop at the breakpoint. If the (lldb) prompt is not visible on the screen use the (⇧⌘Y) keyboard shortcut to toggle the debug area, and then use the (⇧⌘C) keyboard shortcut to place the cursor in the console. To see which object is the delegate of the web view’s scroll view type po self.webView.scrollView.delegate (po is short for “print object”) command at the (lldb) prompt. That’s curious. The web view’s scroll view does not report having a delegate at all. How does a UIWebView handle scroll and zoom events if it is not the delegate of its scroll view? In ViewController.m try setting the webview.scrollview.delegate to the view controller itself. Uncomment the existing code shown below. You need not implement any delegate methods, yet. All of the methods in UIScrollViewDelegate are marked optional. Disable all breakpoints by clicking the breakpoint button in the debug area toolbar. Now build and run with breakpoints disabled. Scroll up and down in the pdf just to see if becoming the scroll view’s delegate without implementing any delegate methods causes any obvious trouble. You will notice that nothing changes behaviorally. The web view continues to work as before. Scrolling works as always and the page number view at the top of the web view updates normally. Somehow, even though your view controller is now the delegate of its scroll view, the web view continues to act as though it receives the delegate callbacks, even when another object becomes the delegate of its scroll view. When you want content within a scroll view to zoom in and out when the user pinches on the screen, you implement viewForZoomingInScrollView: in the scroll view’s delegate and return the UIView you want the system to scale. You can return nil if you do not want the scroll view to zoom at all. Since the web view as it is configured in the test project zooms in and out, it seems likely that the web view returns a view when this delegate method is called. What happens when you override this method in the view controller and return nil? Since the view controller is now the delegate of the scroll view, does this signal to the scroll view that it should not zoom or does the web view maintain control? Might it cause the app to crash or introduce some other nasty behavior? Will the scroll view even call this delegate method on the view controller? Implement viewForZoomingInScrollView: in ViewController.m to return nil. Do not uncomment the more complicated code in this file just yet. Copy and paste the following code instead. This code will log self, the method name, and the scroll view to the console and return nil. Notice in the console that viewForZoomingInScrollView: on the View Controller is getting called many times as the WebView is loaded and initially displayed. Try pinching to zoom while watching the console. If running in the simulator you can hold down the option key to get two touch points, then click and drag to simulate a pinch. Notice that the web view no longer zooms when you pinch and that viewForZoomingInScrollView: is called on the view controller when you attempt to zoom. Now try scrolling. Notice that the page number view and all other behavior remains unchanged. Returning nil from our view controller and setting our view controller as the scroll view’s delegate seems to short-circuit the zooming of the web view, but other behavior remains unchanged. The scroll view seems to treat the view controller as its delegate in this case. Leave the app running and add a breakpoint in the view controller’s viewForZoomingInScrollView: implementation. Try to zoom. The debugger should break. To look at the description of the web view’s scroll view, type po scrollview into the (lldb) prompt and hit the enter key. Notice that the scroll view is a subclass of UIScrollView — _UIWebViewScrollView. It looks like Apple has implemented a custom (private, as denoted by the underscore) UIScrollView subclass for the UIWebView. This may be a clue. Now take a look at the backtrace by typing bt or backtrace into LLDB. Note the call to -[_UIWebViewScrollViewDelegateForwarder forwardInvocation:] in the backtrace. This may be a clue. Hypothesis: _UIWebViewScrollViewDelegateForwarder somehow ensures that the web view continues to work when another object becomes the _UIWebViewScrollView‘s delegate, performing some kind of magic to decide which of the delegates recieves call backs. Subclassing UIWebView as an Investigative Tool. Now you will replace the current, default UIWebView with a subclass called TESTWebView included in the project you downloaded. First, revert the code in ViewController.m to its original state. The easiest way to do this is to navigate in Terminal.app to the directory containing the project and typing git reset --hard. The code you download has a basic git setup for this purpose. You may want to selectively checkout the view controller implementation file or git stash your changes first if you’ve done other experimentation in the project or changed provisioning and code signing settings as git reset --hard will reset the project completely. Open Main.storyboard and select the UIWebView. Navigate to the Identity Inspector and set the class to TESTWebView as shown below. Note: Do not ship a subclass of UIWebView to users; Apple asks you in the documentation not to do this, but it’s often informative to do dirty things like subclassing Apple’s code to understand how things work. Build and run. The app should behave as it did before you subclassed UIWebView. This serves as verification that implementing an empty subclass of UIWebView does not break anything. Scrolling and zooming as well as the little page number view should work as before. Uncomment the scroll view delegate methods in TESTWebView.m shown below. Build and run. Notice that the delegate methods are called repeatedly on launch, much as you saw previously. Add a breakpoint in each new method in TESTWebView, then scroll the PDF to drop into the debugger during -[TESTWebView scrollViewDidScroll:]. Show the backtrace with bt. Type c and hit enter in the debugger to continue. Next try pinching. The debugger should now break in the TESTWebView‘s viewForZoomingInScrollView: method. Type bt and compare the backtraces. Note any similarities. In ViewController.m, once again set the scroll view delegate and reimplement viewForZoomingInScrollView: as shown below. Place a breakpoint after the NSLog line in -[ViewController viewForZoomingInScrollView:]. Build and run with the breakpoints disabled. Watch the console for log messages while scrolling and zooming. Do you discern a pattern or order for the scroll view delegate calls? The LLDB command line has a number of powerful commands built in. Try typing breakpoint list into LLDB. This shows a list of all of your breakpoints. Now find the viewForZoomingInScrollView breakpoint in the list and note its number. In the above it’s “2.1”, but depending on your Xcode setup or other breakpoints you have enabled it may be a different number. To disable that breakpoint type breakpoint disable 2.1 replacing “2.1” with your number and hit enter. Now type breakpoint list again. You should see “Options: disabled” next to the breakpoint you identified. To re-enable a breakpoint, type breakpoint enable and then the number and hit enter. To step through code in the debugger you can use the execution control buttons in the debug area. I find using the mouse to click those little buttons tedious. Luckily, there are commands for all of these in the LLDB command line.